If you are searching for an amazing 1080p home entertainment projector, this model is a really attractive choice. Besides the full HD 1080p resolution, this projector offers 3D support for different video sources (FiOS boxes, Blu-Ray players and cable), as well as audio system that is comparable to that on a typical television, and two HDMI connectors. It is only fair to say that it can easily serve as a nice supplement, or even replacement of the television in your family room. The Optoma HD141X Full 3D Projector is suitable for HDTV, movie viewing, and gaming as well. That’s not all-it can even serve as a business projector in a pinch. This projector represents an amazing value in home entertainment projectors. If you need a projector that’ll put a powerful image on your living room wall, this model is a strong projector that will surely suit your needs. To start with, this projector boasts amazing picture quality. It produces detailed, bright image with good contrast and well-saturated colors. The Optoma HD141X Full 3D Projector will light up your family room or your living room as it produces more than 3,000 lumens in its brightest picture mode. Still, it can put out over 1,000 lumens for an elegant, more refined home theater picture in Cinema mode. Full HD 3D is another great feature of this projector. It will work with nearly any source of 3D, including set-top boxes and Blu-Ray players. 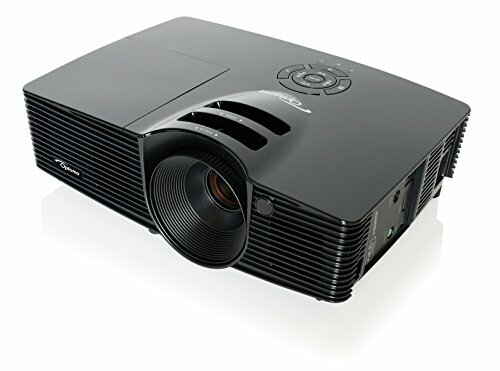 The projector utilizes DLP Link, and it is also compatible with the inexpensive and widely-available 144 Hz DLP glasses. But it also boasts a VESA 3D sync port meaning you can add infrared glasses and emitters as well as aftermarket radio-frequency if you desire. This Optoma projector is a great choice for all the game lovers thanks to its low input lag of 33 milliseconds. At 60 frames per second, 33 milliseconds is only two frames. We mustn’t forget to mention the low cost of ownership with this projector. Not only that this is really an affordable model, but it also boasts an inexpensive lamp that has a long life. This lamp will last for 6,000 hours in Eco mode, or 5,000 hours at full power. This makes the HD141X cheap to operate and to own. The Optoma HD141X Full 3D Projector incorporates MHL technology allowing you to easily and simply connect to your Mobile High-Definition Link (MHL) enabled mobile device with just a single cable solution. This feature will turn your projector into a smart one that allows you to mirror your devices screen, access movies, online content, apps, photos and games stored on your mobile device. Not just that, but you’ll also have the ability of controlling your device with the remote.